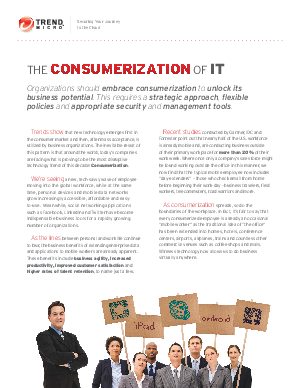 White Paper Published By: Trend Micro, Inc. Answers to Your Mobile Device Data Protection Questions. We’re seeing a new, tech-savvy wave of employee moving into the global workforce, while at the same time, personal devices and mobile data networks grow increasingly accessible, affordable and easy-to-use. Meanwhile, social networking applications such as Facebook, LinkedIn and Twitter have become indispensable business tools for a rapidly growing number of organizations. As the lines between personal and work life continue to blur, the business benefits of extending enterprise data and applications to mobile workers are already apparent. These benefits include business agility, increased productivity, improved customer satisfaction and higher rates of talent retention, to name just a few. Recent studies conducted by Gartner, IDC and Forrester point out that nearly half of the workforce is already mobile and, as a result, are conducting business outside of their primary work place for more than 20% of their work week. Where once only a company’s sales force might be found working outside the office in this manner, we now find that the typical mobile employee now includes “day-extenders” – those who check email from home before beginning their work-day – business travelers, field workers, telecommuters, road warriors and more. The IT landscape is changing quickly, Get expert advice on developing a strategy and learn how your organization can manage security on employee-owned mobile devices.